I was invited by the University of Michigan’s School of Engineering and Center for Entrepreneurship to give a “Ted Talk” on my entrepreneurial journey and how I came to be so passionate about empowering people with their data, privacy and identity. I wrote one of my first blog posts in 2010 about the origins of my thinking when I was a student around concerns of “being defined by others,” so I really enjoyed this special chance to share my story. I’ve never been more convinced that our data-driven future depends on each of us having agency over our data and identity. And, thankfully, the tools and rules to make that happen are finally emerging – like the digi.me Private Sharing platform and the UBDI monetization app (which debuted in beta while I was in Ann Arbor). Personal and digi.me have each helped to define this sector — one that emphasizes individual control over the growing amount of data and analytics about people that fuels the digital world. We have done so by introducing revolutionary tools and rules for giving people control over their own social, personal, financial, health and other data while enhancing privacy, and by attracting world-class investors and some of the brightest minds in the space. Since 2009, digi.me in Europe and Personal in North America have shared a common mission — to put people, rather than companies and governments, in greater control of their own data. We have each made great strides, but we still have a long way to go. This merger will get us there faster and with greater force. The timing could not be better — or the opportunity bigger. A perfect storm is brewing among rising consumer awareness, new regulations and increasingly grave threats to personal privacy and autonomy. Consumers are increasingly aware of the value that holding their own data brings and rebelling against others taking it from them without consent. For example, the Mobile Ecosystem Forum’s 2017 Global Consumer Trust study shows that when sharing data, 31% of consumers value personal data privacy-protection and access to it above financial rewards (29%) or discounts (22%). Meanwhile, new legislation such as the European GDPR will deliver new consumer rights over ownership and use starting in May 2018. And any citizen living in Europe or the United States knows that they are susceptible to various forms of government or corporate surveillance and data mining every day of the week. The vast quantity of data being collected and the deeply private insights from big data analytics and machine learning is accelerating geometrically, with users purposefully left out of the equation. This collision of factors highlights the need for solutions like ours, but looking past the storm reveals a truly brilliant horizon. Indeed, the possibilities of what individuals and consumers can do when they control their own data are endless and powerful. Users, businesses and governments all benefit when private sharing and consent access to personal data occurs. With digi.me, users in Iceland, for example, can access their electronic health records and share relevant data with any medical professional who needs it through the Living Lab project — an example we intend to spread to other countries. In finance, digi.me will be able to help consumers share their personal financial data with privacy and control with a banking or insurance company to help them get the best policy offer and reward their loyalty, but not by taking their data without permission and benefit for the consumer. In education, Personal created a download app with the U.S. Department of Education to help make more than 100 fields of student financial aid data portable and reusable. And a myriad of personal digital assistants and wearables will be able to arm consumers with the power of their own data just as they do for publicly searchable information like directions or comparison shopping for shoes or travel. Just imagine: You choose to integrate your personal data store with Amazon’s Alexa or Apple’s Siri, say “Hey, Siri”, and all of a sudden you can access an image of your passport or get your bank account or health information served up to you instantly and ready to share. There is a tailwind behind what both digi.me and Personal have been working on since 2009, and it gets stronger every day. The merger will allow us to expand quickly to meet this growing demand. Personal has brought to market the world’s best product for individuals and small teams to create and collaborate on data needed for thousands of information-related tasks. It will be fully integrated into the digi.me app later this year. (Personal’s enterprise version of TeamData is being spun off as an information security and productivity company for businesses.) Personal’s development team is first class, and both digi.me and Personal have been pioneers in designing privacy and cybersecurity in their respective platforms every step of the way. Our combined teams will hit the ground running. We are investing in expanding digi.me’s U.S. operation, which will now be led by Shane, and we are already beginning to work with major U.S. brands to partner with our apps and services. On the development side, our teams in London, Sarajevo and the United States will work to expand the ecosystem of personal data API connectors to new third-party apps and services and will integrate with major brand partners in multiple countries around the world. Welcome to the new digi.me — a powerhouse that will help consumers connect their data with companies and their governments to help them make better decisions and improve their lives! Julian is the founder and chairman of digi.me. Shane, co-founder and CEO of Personal, is now CEO of digi.me’s U.S. business. Ben Horowitz was right after all. He told us a few years ago that our model of user-centric data management was all wrong for consumers, but that it just might work in the enterprise. Realizing we weren’t buying, he sent a nice follow up email to encourage us to seriously consider changing our focus. We were so convinced we were right I’m not even sure if we wrote back (sorry Ben). Today Personal.com and our Personal Data Cloud solution are becoming TeamData, a reflection of our shift toward solving critical information management and data collaboration needs of companies and their employees, as well as with consultants, vendors and customers. Enter the enterprise. Despite game-changing transformation from team productivity and collaboration solutions in recent years, employees still have to hack their own standalone solutions to organize the information they constantly need to get stuff done — like spreadsheets, notes apps and even contact cards in their address book. Meanwhile, email, messaging, calls and in-person interruptions remain the standard for requesting and sharing data. Entire classes of jobs continue to exist solely to organize, manage and update information manually for teams and their members. Most existing solutions for team productivity excel at unstructured data (e.g. files or notes) or messaging and project management. And the few products that understand data, like password managers and digital wallets, are limited in the types of data they manage and their security was not designed for collaboration. The reality is we’re all still kickin’ it old school when it comes to organizing and sharing information. Current solutions do not solve the complex challenges of structured, reusable data — which is hard to protect, growing exponentially, changing constantly and needed in super-unique combinations for different lengths of time by people inside and outside of companies. That’s because data is a related, but altogether different game that requires deep understanding of the data itself combined with granular permissions to enable its reuse in limitless combinations while providing entirely new types of security (e.g. we follow Privacy-by-Design principles). What’s so special about networked, structured data is that it can be reused over and over across an entire company, and everyone with permission automatically has access to the most up to date version when anyone makes a change (they can also have their access turned off). 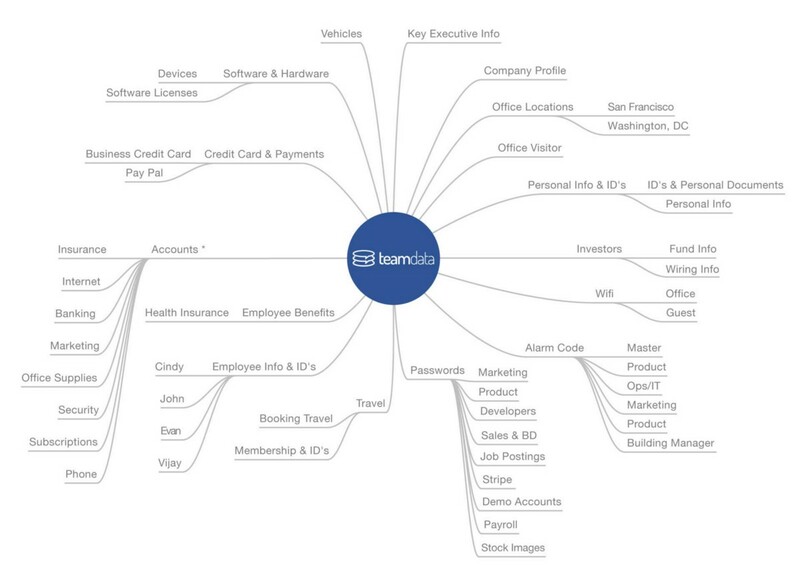 There is literally only one copy of the company name, address and Federal Tax ID in a TeamData graph. One instance of the company social media account logins, demo server credentials, and visitor wi-fi. And so on, for over 1,200 different types of data covering thousands of different tasks. Finally, networked, machine-readable data will also unlock new kinds of innovation when employees and companies grant permission to apps and analytics tools, like the new generation of AI-driven digital assistants. We are still passionate about our vision to empower consumers with data. We already see employees starting to form teams outside of the office using their private data, and know they will discover whole new ways to use our tools. For now, we’re excited to keep our heads down and keep solving all the challenges companies and employees face every day. Give it a try and let us know what you think — teamdata.com. This post was originally published here in Medium. I’m pleased to introduce you to Fill It Mobile for iOS! It’s our new app for iPhones and iPads that enables you to have secure, 1-touch auto-fill experiences in mobile native apps and on mobile sites. (Over the summer, we released Fill It Mobile for Android at Google Play). I’m especially excited to announce the launch at the 2014 Privacy Identity Innovation Conference (pii) in Palo Alto today. Personal won the pii Technology Showcase Award in 2012 and the pii Audience Spotlight Award in 2011, the first time pii held the competition. Fill It Mobile for iOS rounds out our revolutionary form-filling offerings that started with the introduction of the Fill It web extension over the summer for Chrome, Safari, Firefox and IE browsers, which can automatically complete any web form in what is now the world’s largest index of 1-click forms — 310,000 and growing. Here’s our press release on Fill It for iOS. Fill It Mobile for iOS and Android addresses two of the biggest areas of friction for users in mobile apps and transactions – the difficulty of completing forms on mobile devices and reusing our data across apps. It aligns perfectly with our mission to make individuals the hub of all of their own data, and solves an enormous challenge for companies and apps. shopping and loyalty and rewards sign upsWhen you see an app or company form that is enabled for Fill It Mobile, just click a button to complete and submit it (after reviewing it, of course). You’ll be able to use the data from your Data Vault to populate it and, if you’ve had to add new information to complete it, you’ll be able to save it to your Data Vault for future re-use. When you see an app or company form that is enabled for Fill It Mobile, just click a button to complete and submit it (after reviewing it, of course). You’ll be able to use the data from your Data Vault to populate it and, if you’ve had to add new information to complete it, you’ll be able to save it to your Data Vault for future re-use. Forms can also be launched and completed using QR codes. And when a paper or PDF form is still required, just print or share a PDF version of the completed form via email. You can even sign it with an e-signature app. To complement our Fill It Mobile apps, we’ve also released updates to our Data Vault apps to iTunes and Google Play, which are designed to interact seamlessly with Fill It Mobile. So now you have two more reasons to go to Google Play and iTunes. Try out Fill It Mobile for iOS and let us know what you think. By necessity, we had to design and build an open ontology for different fields of structured data and meta-data – which number over 1,200 at present. Other efforts to better organize data informed our work, like the semantic web, but we had to stick a flag in the sand to make a user-centric system work. We have published the ontology, which you are free to adopt or help us improve upon. You can search and interact with the ontology, which features DataRank (next section) here. We analyzed hundreds of thousands of actual forms and millions of data fields and learned what fields were most commonly used. We call this “DataRank”. DataRank literally ranks every field of data we support according to popularity and frequency of use. We constantly add fields to the ontology and continue to refine our DataRank algorithm. Email us at forms@personal.com if you have data fields you’d like to be added. We have indexed over 300,000 forms, which are all searchable and rated according to a 4-star system to help you understand how well the form supports auto-fill. We start by matching supported fields from our ontology against specific fields on a form. A combination of machine learning and review ensure that matching occurs properly. Once matched, your data can be delivered securely from your vault to that field or a company’s back end in the required format. We call this our “semantic graph”. The video highlights several examples of how messy and complicated this problem is for autofill. Personal’s ontology also supports structured meta-data for notes, descriptions, and other unstructured information and files – making all of those types of information and files reusable. This works especially well for frequently used information like company descriptions, personal bios, or step-by-step directions to your office or home. Our last layer of logic, the Correlations Graph, is where some of the coolest magic happens. It analyzes the instances of data you and others use to complete a form — all while maintaining the privacy of your actual information. For example, you may have a number of different names and addresses in your vault. The Correlations Graph figures out – without looking at the data itself – which name and address to use based on the context of the forms. It correlates which data belong together to help it predict with more accuracy the correct data to use in a form for a child, spouse, doctor, car, or anything else you’re managing in your vault. The Correlations Graph gets smarter the more you use Fill It. We just released a new version of our Data Vault app for Android. The iOS version will be available soon. The updated Data Vault app is designed to be interoperable with our new Fill It mobile app – as well as with the Web versions of both Fill It (browser extension) and the Data Vault. To celebrate the occasion, and to ask for feedback from Android developers and users, we are offering a free lifetime subscription to Personal.com (a $29.99 per year value) for the next 10,000 people to download the Fill It and Data Vault apps from Google Play. Data you create in any of the apps will be stored securely in your private, cloud-based Data Vault, and will then be instantly synced across devices. We have also improved the user interface, and created more streamlined, intuitive options for adding data – including by using forms in Fill It. You can search, add or edit your information and passwords on the go, even when offline. Easy touch and hold functionality allows you to copy and paste info wherever you need – e.g. Wi-Fi and passwords. We are excited to announce the launch of Fill It Mobile at Google Play, with the iOS app soon to follow. As you’ll recall, we launched the Fill It web extension earlier this summer for Chrome, Safari, Firefox and IE, which can automatically complete any Web form in what is now the world’s largest index of one-click forms — 225,000 and growing. Fill It Mobile addresses two of the biggest areas of friction for users in mobile apps and transactions – the difficulty of completing forms on mobile devices and reusing our data across apps. It aligns perfectly with our mission to make individuals the hub or all of their own data, and solves an enormous challenge for companies and apps. Forms can also be launched and completed using QR codes. And when a paper or PDF form is still required, just print or share a PDF version of the completed form via email. You can even sign it with an e-signature app. (More on that later). To complement the release of Fill It Mobile, we’re also releasing updates to our Data Vault apps to iTunes and Google Play, which are designed to interact seamlessly with Fill It Mobile. So now you have two reasons to go to Google Play and, soon, iTunes. Try out Fill It Mobile and let us know what you think.